testPoint | Mac App Storeのアプリ検索・ランキング BuzzMac! testPoint is a handy tool to test & tuneup the monitor as well as the user's working position. In example it's useful to assess the influence of the ambient light to the color perception. testPoint shows test templates on computer screen. Most of templates have tunable properties. The user can tuneup these properties via hotkeys, mouse or interactive dashboard. There are 78 prepared templates. Users can create their own tests too. All tests can be combined in groups, thus organizing the test process. 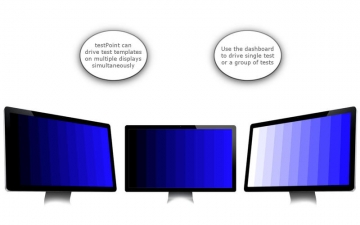 testPoint supports video walls - up to 6 rows and 6 columns on one screen. All running tests can be driven simultaneously or separately. The user can select on which screen to open the test template. The template is launched on the current desktop. This way the user will be able to continue with its other tasks on other desktops. Each test can be associated with a dashboard - just click with the right mouse button. The dashboard can drive one or multiple tests in an interactive manner. A short description of the current test is available in the dashboard. - Basic colors, Bad pixels. - Color stripes, gradients and gamut. 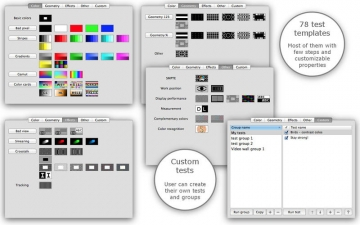 - Color cards: Web safe, X11, CSS3, Gray lightness, Hue lightness, HSL/HSB. - Effects: Bad view, Smearing, Crosstalk, Tracking. - Work environment: Color recognition level, Brightness and contrast, Eye moire. - Geometry. A lot of old CRT and projector tests: High voltage, Dots, Grille, Circles, Focus. 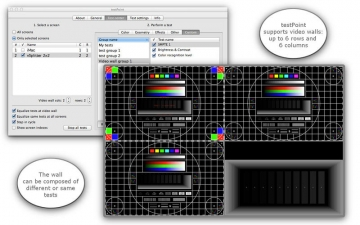 - Display performance: Complementary colors, Moire, Resolution, Focus, Convergence, Readability. - Common testPoint panel for actions, settings and information. 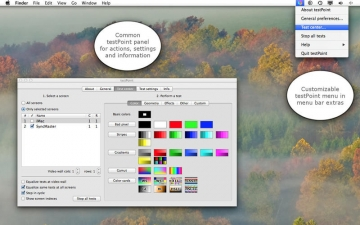 - Customizable menu in menu bar extras. 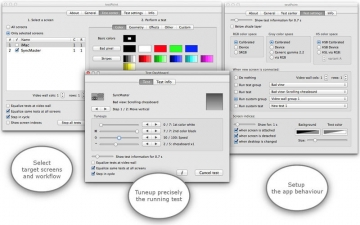 - Hotkey to show or hide application menu in menu bar extras. - Support multiple users, screens and desktops. - Can start automatically at user login. - Built on Apple's security paradigm sandboxing - reducing the threat of rogue code and malicious software. Note: When testPoint is running, no icon is shown in the Dock. All the basic control is through a menu in menu bar extras. ••• If you have an inquiry or need a help to tune up our app, please drop us a line at support@coderace.net. We will reply in 24 hours.